Ahoy, matey! 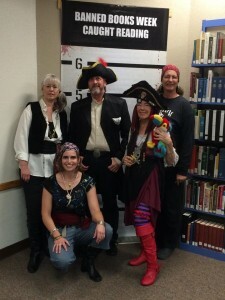 Pirates were spotted at the Alamogordo Library, on September 19th 2014. Staff and patrons gathered together to celebrate International Talk Like a Pirate Day. While the children’s section of the library is alive with fun programs and arts and crafts, the adult side is quite a bit more staid and quiet. We sought to liven that up with a day of fun activities and costumes aimed at older teens and adults. Fully supported by our local Friends of the Library group, we offered several activities throughout the afternoon. Participants were invited to join the Treasure Hunt which had them following clues through the stacks and every collection to get to the prize at the end (candy for those with a sweet tooth). There was challenging pirate trivia as well as a Create-Your-Own Pirate Flag station with historical depictions of actual pirate flags as inspiration. We also touted our Mango Languages access with their fun options of speaking “Pirate”. To make sure the children were not left out, though, there were puzzle sheets and a story starter as well as a fun pirate paper plate craft to enjoy. Children and adults were encouraged to come dressed in costume and staff members were authorized to wear costumes as well. Learn more about the Alamogordo Public Library on Facebook, Pinterest, and Twitter!